A lot of Pokemon ended up with some significant boosts thanks to their Alolan forms. Some Pokemon transformed completely into new Types, becoming almost completely unrecognizable, while others had more aesthetic changes in addition to any new Types they got. There were definitely a large number of Pokemon that really deserved this upgrade of sorts, and it just so happened to be the case that Alolan Raticate…was one of them? Huh, I guess Rattata and Raticate needed something to keep from falling into obscurity as “generic rat Pokemon”. Alolan Raticate-GX is a Stage 1 Darkness Pokemon-GX, 200 HP, with a Fighting Weakness, a Psychic Resistance, and a Retreat Cost of 3. Chuck Away costs no Energy, but it does ask you to discard up to 2 cards, and then it’ll deal 40 damage for each of those cards discarded. Hyper Fang is a 3-for-150, but it comes with a coin flip that, should it land on Tails, means the attack will do nothing. And Item Maniac GX also costs no Energy and lets you add up to 6 Items from your deck to your hand. Chuck Away though has a lot going for it. Free discards for free damage? That’s pretty good, but the best part is probably that there’s no specifics as to the kind of card you discard, meaning you could be discarding, say, Energy to accelerate with another effect later on in the game. Yes, you’ll likely be attaching Energy regardless, but fueling up that discard pile to take advantage of it later? Pretty nice. So he combos well in decks that want to put Energy into the discard pile – however you do end up with smaller hands that don’t do as much if you discard all your Energy right away, and if you discard stuff other than Energy, you’re likely to run into other problems. Alolan Raticate-GX isn’t bad as far as Pokemon-GX go, but considering what all it does, it doesn’t do enough to really cement itself in a lot of decks that it could end up in otherwise. 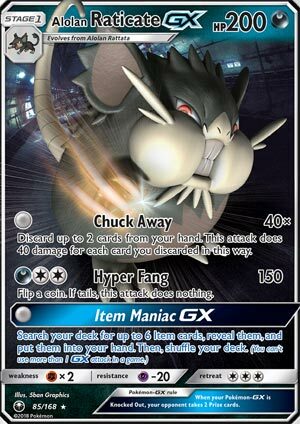 Chuck Away can load up the discard pile, but it depends on what’s in your hand at the time, Item Maniac GX is a situational move that asks if you really want to spend your GX Attack for a bunch of Item cards, and Hyper Fang is so terrible that I’d rather not acknowledge that it’s a move they put on a Pokemon-GX. Arora Notealus: Alolan Raticate-GX does a lot of things well enough, but there’s a level of…inconvenience to them. It’s not all bad for him though, but I don’t think that Fighting Weakness with the heavy Retreat Cost is going to do him any favors either. LOSE SOME WEIGHT, MAN!! Weekend Thought: What were your thoughts on this week’s cards? Think that there’s potential with some of these cards? Do you think that some of these cards are better or worse than what we think of them? Will you be trying them out in your own decks? Free attacks – that is, attacks with no energy required – is one of the few blessings that you’ll find in the Pokemon TCG. That is because you don’t have to put further investments, only to be put in the discard pile because of a card effect or being flat out KOed. It also makes tanking and healing viable because Max Potion doesn’t have drawbacks – there’s no energy attached to this Pokémon to begin with. Additionally, you don’t get hit hard than if you had energy attached to it. Makes Gardevoir-GX and the like hitting for little damage, unless they load up energy in their own. For Alolan Raticate-GX’s case, the only attack that needs energy is Hyper Fang. Except that it is not worth the DCC cost that does for 150 half of the time. Now that the boring part is out of the way. We get to the other two attacks that are free to use. Chuck Away says you may discard up to two cards form your hand, and it does 40 damage for each card that you’ve discarded. As a free attack, the damage is good, but sometimes there are some cards that you don’t want discarded, for fear that you might not be able to get it back. Item Maniac GX does live up to its name, as it fetches you SIX item cards and put them into your hand, ready to be used on your next turn! This attack is not always a good thing, as a few decks can punish you on having too many items on your hand. And even if is not the case, Garbodor’s Trashalanche will do 120 more damage if you played all six of your desired items. Alolan Raticate GX (CES 85) scampers into the Pokemon Trading Card Game out of the Celestial Storm expansion set. This 200 HP, Stage 1 Dark Pokemon has three attacks, two of which are FREE! Chuck Away is free and does 40 damage for each card you discard from your hand, although it is strictly limited to two cards. The only attack it has that costs anything is Hyper Fang, which does 150 damage for a Dark and two Colorless energy. That’s not a bad cost, but it requires a coin flip: if tails, this attack does nothing. Alolan Raticate’s GX attack, however, definitely caught my eye when I was reviewing this card. This seems to me to be the perfect Beast Ring set up. You play Item Maniac GX, you go get all four of your Beast Rings and a couple of other Item cards to boot, Alolan Raticate GX – or even one of your other GX Pokemon – gets KO’d next turn and BAM you go hog wild on energy acceleration. And there are other possibilities as well. You could go get a bunch of hammers and knock off all of your opponent’s energy, you could go get whatever ball search cards you need, Rare Candy, Choice Bands, Wishful Batons, the list goes on. We have a lot of good Item cards, getting six of them in one fell swoop is going to be a fantastic advantage for you. Of course, you could get Judged or Let Loosed, but that doesn’t happen all that often. It’s not going to happen every time, and it forces your opponent to drop their hand size down to four as well. I have not tested this out yet, but I definitely want to give it a shot. I’ll let you know how I do with it! We close the week with Alolan Raticate-GX (SM – Celestial Storm 85/168). This Stage 1 [D] Pokémon-GX has 200 HP, [F] Weakness, [P] Resistance, Retreat Cost [CCC], two regular attacks and one GX-attack. For  it can use “Chuck Away” to discard up to two cards from your hand, then do 40 damage per card discarded. [DCC] pays for “Hyper Fang”, which does 150 damage BUT requires a coin flip; “tails fails”. also pays for “Item Maniac-GX”, which lets you search your deck for up to six Item cards to add to your hand. I was very excited about this card when I first saw it, and I actually traded for four of these shortly after SM – Celestial Storm released so that I could begin testing with them. THEN I realized most of my plans required other cards, so I rushed and overpaid a bit but got what I needed and FINALLY tested over the last week, week and a half. That’s right; this review is NOT pure Theorymon! Good thing I did test; I was very, very off in my predictions for this card. Even when it came to specific stats or attacks, the performance was often not what I expected. Being a Pokémon-GX definitely mattered; the PTCGO isn’t too far off the actual metagame, with many, many anti-Pokémon-GX decks. Same for being a Stage 1; for reasons I’ll soon explain, my decks weren’t as reliable as I’d have liked and I REALLY felt it with Alolan Raticate-GX often showing up sans Alolan Rattata or vice versa. Being a [D] Type sometimes mattered due to the odd bit of Weakness or Resistance or my opponent running Devoured Field, but I wasn’t running any actual [D] Support. 200 HP was about as durable as I expected, maybe a little more… but 200 is far from OHKO-proof, and I encountered quite a few decks running Shrine of Punishments, so pseudo-OHKO’s were more common than I liked. [F] Weakness also led to easy OHKO’s but wasn’t always a guaranteed OHKO; that may have been luck as the [F] Type attacker I usually encountered was a Buzzwole with only one Energy attached. The [P] Resistance saved Alolan Raticate a few times; there’s a decent amount of [P] decks in the format. That Retreat Cost of [CCC] really hurt, as Alolan Raticate-GX frequently got stuck up front… even in Expanded where I was running four Float Stone. Probably because I was TRYING to run it as an opener for a zero Energy deck built around the “Roto Motor” Ability found on certain Rotom cards. Said Ability allows that Rotom card in question to ignore the Energy requirements for its attack provided you have at least nine Tools in your discard pile. Standard lacks Battle Compressor or Professor Sycamore. I was also worried about Alolan Muk, though I never actually faced it, so Alolan Raticate-GX served as a counter to it as well. Chuck Away proved far more expensive and far less effective than I thought; using it more than once or twice really eats away at your resources unless you’re fortunate enough to have the Tools you want to discard or spare copies of Pokémon handy. That two-card cap keeps Chuck Away from hitting hard enough far too often, and also makes it far too slow a means of pitching Tools even when you’ve got what you want to toss in hand. It wasn’t awful, just nowhere near as effective as I hoped. I never ran Alolan Raticate-GX with Energy, so I never used Super Fang. It looks too expensive and unreliable to me… but it is pretty close to making sense. [DCC] isn’t too bad for most [D] or partial [D] decks to cover, and 150 is a great return for that. HOWEVER, you’ll need a Choice Band or Muscle Band to hit key numbers AND that means you aren’t using Trick Coin (in Expanded). Could you run Victini (BW – Noble Victories 14/101, 98/101; BW – Black Star Promos BW32; BW – Legendary Treasures 23/113) or Victini (SM – Guardians Rising 10/145), the latter still being Standard-legal? Sure, but Pokémon-GX aren’t the only thing being heavily countered right now; Abilities are a concern as well. If Hyper Fang did more damage and/or required a double coin flip with it only failing on double “tails”, it could be good or even great. Item Maniac-GX also didn’t live up to my hopes; getting six Items at once is great BUT your opponent has an entire turn to turn good choices into bad or simply use an effect to shuffle your hand. After all, Marshadow (Shining Legends 45/73; SM – Black Star Promos SM85) is ALSO getting its due. It was nice having an excuse to run Hala… but then we got to that issue of a Stage 1 Pokémon-GX being used for its “set up” attack early game. Even when the cards otherwise cooperated, I didn’t always have time to use Item Maniac-GX. Alolan Rattata was also an issue. There three distinct versions, each with its own pros and cons: Sun & Moon 76/149, SM – Burning Shadows 81/147; SM – Celestial Storm 84/168. ALL are Basic, [D] Pokémon with 40 HP, [F] Weakness, [P] Resistance, and NO Abilities. Sun & Moon 76/149 has a perfect free Retreat Cost and can use “Gnaw” for  to do 20 damage; both traits got it into my decks. SM – Burning Shadows 81/147 has a Retreat Cost, “Focus Energy” for , and “Bite” for [D]. Focus Energy just causes Bite to do 60 more damage on your next turn, but Bite only does 10 base damage; two turns to do 70 with a 40 HP Basic is insanely BAD, even if you only spend [D] doing it. SM – Celestial Storm 84/168 also has a Retreat Cost of [C], but has “Call for the Boss” and Gnaw (again). Call for the Boss costs  and lets you search your deck for an Alolan Raticate or Alolan Raticate-GX and add it to hand… as I said, Alolan Rattata has only 40 HP, so that’s bad even if it is “free”. Even as an Ability it would be iffy because even in Standard, your hand isn’t safe. I found myself wishing it would instead Bench an Alolan Rattata from my deck or discard pile pretty often. Gnaw needs [CC] to do 20 damage this time, so I’m confident I ran the right Rattata. So, for Standard, Alolan Raticate-GX proved too slow to help with strategies that want certain cards in your discard pile and wasn’t up to snuff as a back-up/alternate attacker or even to set up for Hala. In Expanded, the same thing happened except I knew it wasn’t as needed for discard cards due to Battle Compressor and Professor Juniper (or Professor Sycamore). So, Alolan Raticate-GX just gave me an easy or easier to OHKO Basic and a Stage 1 that just wasn’t helping as much as I needed AND ensured I had to run at least one Pokémon-line worth two Prizes when KO’d. I’d planned on testing it with Night March as well, as an emergency method of attacking sans Energy and/or discarding Night Marchers… but the Roto Motor failures convinced me to look for something else. There is that recently revealed Spirit Tomb from their latest set; it requires [C] and does no damage, but it can attack to discard four cards of your choice from your deck. Anyway, the only place Alolan Raticate-GX is likely to shine is in the Limited Format; anything that isn’t a +39 deck can run it as a universal bit of backup, even if you don’t have the right Energy. Next articleTransformers TCG Now Available from Hasbro & Wizards of the Coast!